Phillip W. Magness » Is Piketty’s conclusion unaffected by his data problems? Is Piketty’s conclusion unaffected by his data problems? Last night FoxNews.com ran a decent synopsis of the new article on data errors in Capital and the 21st Century that Robert Murphy and I have coming out in the Journal of Private Enterprise, as well as the new article by Kevin Hassett and Alan Auerbach that I mentioned in my last post. While I tend to be skeptical of cable news, whether on the political right like Fox or political left like MSNBC, I felt that the article’s author Maxim Lott did an exceptional job at distilling a complex and ongoing academic debate into a highly readable article. He was also entirely fair to Piketty, and quoted his response to the two papers at length. Piketty told FoxNews.com that, even using the American authors’ graph, his ultimate conclusion remains intact. I’ll readily grant that Piketty has every right to defend his work and I would not expect him to agree on every counterpoint or criticism made by myself or any of the other authors. Still, if one were to summarize the recurring message of both Piketty and Capital’s many advocates in response to data critiques from Giles’ article last May through the present, our article included, it is this: Despite the many errors in his data and history (or “typos” as he now calls them), Piketty’s overall conclusion remains intact. I would urge anyone who holds that belief to look to not just the synopsis of our work, or of Auerbach and Hassett or any other data critique, but to read the full articles. You will find evidence of more than just a few “typos” but rather deep problems with some of the most important charts in Piketty’s book. For example, I argue that Piketty’s main graph purporting to show consistently rising United States wealth inequality since the mid 1980s is actually a result of an exercise in cherry picking favorable points from far more ambiguous source data. As we demonstrated at length in our paper’s Sections III and IV, the source literature on U.S. wealth inequality – including the very same data sets that Piketty uses to construct his charts – suggest the current trend is either flat or only slightly rising instead. 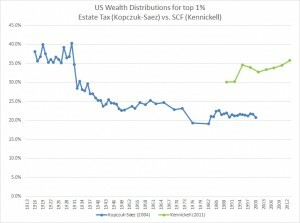 This is not simply an interpretation we have given to these data – it is an ambiguity that is readily apparent when one simply graphs out the two main estimation techniques that Piketty himself used, estate taxes and the Survey of Consumer Finances (SCF). The estate tax estimate (in blue) is flat from the mid 1980s onward. The significantly less complete SCF estimate (in green) suggests a very modest rise. (Note there is an expected gap between the two trend lines that is due to differences in their estimation techniques. The key is the trend within each series). Compare the above to Piketty’s figure 10.5, which shows a clear trough in the 1970s, and a clear upward trend ever since. Piketty’s chart is constructed out of the exact same data sets, though selectively so as he adds and drops multiple source data points at different periods in history to obtain an increasing inequality trend for the past 30 or so years. 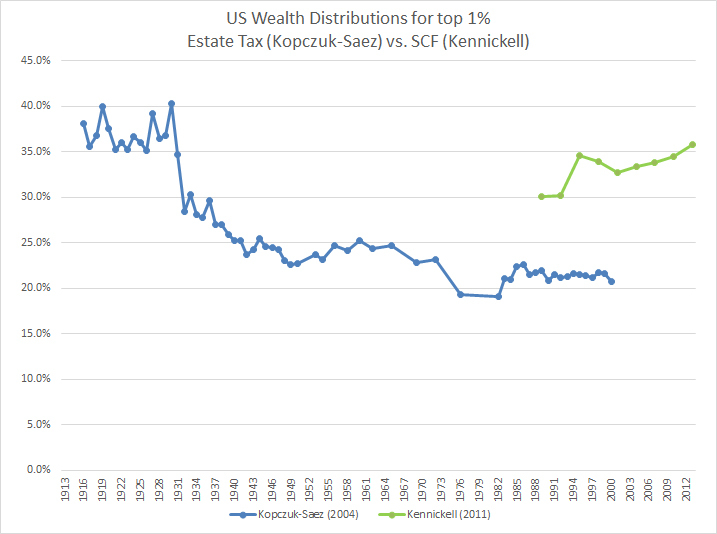 Specifically – he uses the low point on the estate tax estimate (the blue line) to create his 1970s trough, then he switches to the SCF (the green line) to give the illusion of a much more severe increase than the SCF series shows on its own. This cherry-picking assemblage is documented in detail in our paper. With all of that in mind, I’d like to return to the claim that even with the data errors, Piketty’s conclusion is still intact. It seems to me that this retort is completely evading a fundamental burden of conducting empirical research – the burden of substantiating one’s assertions with evidence. Piketty’s assertion is a simple one – that, after a mid 20th century trough, wealth inequality is on the rise again. He offers a theory to explain this assertion by positing that we should expect a capital stock reconstitution that, over time, produces yields for capital-owning rentiers that outpace income growth along the lines of the famous r>g formula. But in order to demonstrate that it is actually happening, he also needs data. Therefore he presents a series of charts that purport to show empirical metrics of rapidly increasing wealth inequality over the past 30 years. That’s where Figure 10.5 comes in, as it is Piketty’s primary piece of empirical evidence behind his claim that inequality is on the rise in the U.S. (Note that others have found similar problems with his inequality charts for other countries). As we’ve seen though, the U.S. chart is a product of cherry-picking favorable numbers and excluding unfavorable ones. The raw source data behind 10.5 is actually ambiguous as to any single trend. If not data, on what basis was Piketty’s conclusion ever substantiated in the first place? 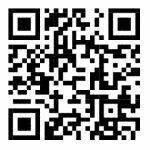 This entry was posted by Phillip W. Magness on Wednesday, January 7th, 2015 at 9:51 pm	and is filed under Uncategorized. You can follow any responses to this entry through the RSS 2.0 feed. Both comments and pings are currently closed.